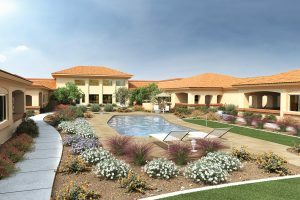 If you are looking for individualized, compassionate memory care, Glendale AZ’s newest senior living community is your answer. Within MorningStar of Golden Ridge’s Reflections Neighborhood, we offer 35 secure suites dedicated to the care of residents with memory impairment due to Alzheimer’s disease or other forms of dementia. And while we may be a new community, our team is comprised of specially trained care givers who understand the disease and offer residents the respect and dignity they deserve. Our calling—our privilege is to connect with and nurture the essence of each individual every day. MorningStar of Golden Ridge’s unique approach to memory care is designed to affirm the value of our most tender residents as we celebrate the smallest of successes and find joy in fleeting recognition and flashes of clarity. Our Reflections Neighborhood is equipped to care for those at the onset of the disease through to the most advanced stages. By creating a safe and loving environment, residents feel free to move about in spacious surroundings that include a secure courtyard reserved for memory care. We also provide 24-hour care managers, a full-time licensed nurse, medication management and scheduled transportation as well as many on-site amenities such as a full salon, theater/chapel and a host of wellness programs and activities. Another special component to memory care at MorningStar of Golden Ridge is our care team. We seek great hearts who know how to perfect the art of anticipating needs and are willing to go the extra mile, knowing service to seniors is an act of love. Moreover as dementia care experts, our care also extends to residents’ families as we endeavor to help them better understand and cope with the disease. At MorningStar of Golden Ridge, we proudly exemplify the best in senior living with a unique mission statement of “to honor, to serve, to invest.” Our foundation is built on honoring God, valuing all seniors and selecting staff with a felt calling to serve with the goal of creating a true home for residents in a beautiful, peaceful setting. Please contact us to learn more about the most compassionate, specialized memory care Glendale AZ offers.